This page is intended to act as a resource for phone forensic examiners who are working with physical extractions (“hex dumps”) of mobile phone handsets. It aims to provide advice as well as usable search terms and regular expressions that phone examiners can use to find key data within a mass of hex data. The page is split into two sections to reflect that certain types of data are commonly stored as files (e.g. video, MMS etc.) whereas other data types such as previous SIM details may be stored as individual “records” rather than in files. Do also refer to Gary Kessler’s excellent file signature page – we can’t live without it! could be used to find all occurrences of the five valid UK IMSI prefixes. The regular expression could be extended to specify that the remaining 9 characters must be digits, but this makes the regular expression much longer and somewhat confusing (due to the fact that we are writing a regular expression to match hex rather than one to match text). could be used to find all occurrences of the five valid UK ICCID prefixes. This search term may identify SMS present within a memory dump. Further work will be required to determine the actual start and end of the SMS message. The message content itself is quite possibly encoded using the GSM 7-bit alphabet (i.e. not ASCII) so don’t expect the words of the text message to jump out at you! Some Samsung handsets (e.g. D500, D600 etc.) use the keyword “DEADBEEF” as a delimiter between text messages in the handset memory. Running a ASCII text search for “DEADBEEF” on such a handset should yield results – and if you are searching the OneNAND raw memory then you’ll be looking at live and deleted messages (only live messages can be recovered from the FAT file system layer). Commonly encountered “4th byte” values are 0×14, 0×18, 0x1C, 0×20. The regular expression above will match on 3GP/MP4 headers with any value present in the 4th byte. Most mobile phone handset manufacturers provide some form of security code or PIN function on their devices which is separate to the PIN mechanism provided by the SIM. The table below attempts to document the default values for such handset security codes which may allow access to a device.Note that as some manufacturers will use different default values on different handset models, it is highly recommended to download a copy of the handset user manual from the manufacturer’s website in order to see if it documents the default security code setting of the handset. Flowchart for assisting in attributing photos which may have been synchronised via PhotoStream or shared via iCloud Photo Sharing. The attached report relates to a “logical extraction” of a mobile device. A logical extraction requires the device to be powered on and data is extracted from the device by means of a series of queries (by the extraction software) and responses (from the device). The contents of a powered mobile device are changing continuously and therefore the state of the device is not exactly identical to when it was taken into custody. The attached report relates to a “physical extraction” of a mobile device. A physical extraction typically involves using software on a PC to take as full and accurate a copy of the contents of the device’s memory as possible. This data is then decoded and interpreted by a forensic software tool (this may be the same software used to extract the data from the device or a separate software product). In the majority of physical extractions, data will have been copied from the device whilst it was powered off, however, this is not always the case. included within the report is only that which it has been possible to decode and interpret. This document is intended to accompany the slide presentation “Has Anyone Seen A Career Path Around Here?” first delivered by Kevin Mansell in June 2014. This document is intended to accompany the slide presentation by Kevin Mansell of Control-F, entitled “Has anyone found a career path?” and provides further detail than can be conveyed via the slides alone. The job of a mobile forensic examiner is multi-faceted and complex. Mobile devices often need to be coaxed and coerced into yielding their contents. Once data has been extracted, items of evidential interest are not always immediately obvious and may require skilful analysis in order to locate and interpret them. Added to these technical aspects of the role, mobile device examiners worldwide are faced with the challenge of examining increasing numbers of ever more complex devices with limited resources. The danger of slipping into treating mobile forensics as a “handle turning” exercise is real and ever present. The wider organisation in which the mobile forensic examiner is employed is likely to have a very limited understanding of what the role actually entails. Mobile forensics may be seen as some sort of magic, or perhaps more worryingly as a simple low-skilled role: plug in the device, click some buttons, print the report and move on to the next device. Until the role is properly understood by management and human resources departments, job descriptions for mobile examiners will not properly reflect the role being performed. This already means (in the UK at least) that mobile forensic examiners are often paid less than their colleagues employed as computer examiners due to mobile forensics being perceived as being a less skilled job. Consequently highly skilled mobile forensic examiners will transfer to computer forensic roles for more pay, move to another organisation for a wage increase or leave the field entirely. All three of these outcomes are damaging to mobile forensics as a discipline and the criminal justice system that they serve. Evidence recovered from mobile devices, and the testimony given by the examiners who recover it, affects people’s liberty. There have been miscarriages of justice in the UK and elsewhere where forensic evidence has either been mishandled, misinterpreted, overstated or ignored. To date there has not been a “headline” case in the UK where mistakes relating to mobile forensic evidence have led to a miscarriage of justice, but if it can happen with DNA and other “traditional forensic” disciplines, it is only a matter of time before mobile forensics, forensic examiners and their employers fall under the spotlight for the wrong reasons. Just ten years ago, most mobile phones didn’t have cameras, memory cards, Internet access or GPS functionality. Although cheap “burner” handsets without those capabilities can still be purchased, almost all new handsets are smartphone devices1. Those changes are part of the reason why mobile device forensics is becoming ever more complex: we have more devices which can perform more tasks. At the same time, we have a wider array of techniques for recovering data from mobile devices. The decision as to how to process a particular evidential exhibit coupled with the skilled analysis required to locate and interpret key evidence has never been more important. Many organisations employing mobile forensic examiners are deploying kiosk-based products operated by staff who do not have a background in digital forensics, typically to process devices associated with volume crime. These staff will not have the same skills or experience as examiners within a dedicated forensic unit. Although this is not a problem in itself, many organisations fail to properly distinguish between the two roles. Just as paramedics play a vital role in healthcare provision, dealing with a huge range of medical scenarios, there is also a need for “generalists” in the field of mobile forensics. Equally, we expect our healthcare providers to employ skilled anaesthetists, surgeons and consultants; highly trained and experienced staff in specialist roles. In mobile forensics we need to encourage the development of specialist staff with specific skills: bypassing security mechanisms, interpreting mobile web artefacts, de-soldering flash memory chips, recovering deleted data from smartphone app databases etc. Employers of mobile forensic examiners need to recognise the different dimensions of the job and build organisational structures where staff can progress and be promoted into specialist roles. However, before that can happen we need a model that describes mobile forensic examination in sufficient detail to allow accurate job descriptions to be written. The remainder of this document proposes such a model. This document and the accompanying slide presentation propose a 3-level model, informally described as consisting of levels at 50,000 feet, 5,000 feet and 5 feet. The use of imperial units should not preclude use of this model in countries that state altitudes in metres! At a high level, mobile device forensics can be considered as consisting of acquisition of data from mobile devices and analysis of that extracted data. In many organisations these two roles will be performed by the same person (examiners typically had to be a “jack of all trades”), but it is important to note that this need not be the case. There are today, and increasingly will be in the future, advantages from having staff specialised in either the acquisition or analysis aspects of mobile device forensics. Acquisition can be broken down into the following sequence of tasks. Although these tasks may often be conducted by the same person for a particular device examination, this need not be the case. Steps 1-3 in particular are skilled tasks. Step 3 (“Evaluation”) is especially important due to the real possibility that a particular extraction tool/technique will only recover a subset of all relevant data from a particular device and hence further examination will be required. Analysis can be broken down into the following sequence of tasks. Again, these need not necessarily be conducted by the same person for a particular examination. Mobile device forensics requires knowledge and practical skills in the following five subject areas. Note that the sub-topics listed should not be considered a comprehensive list, but rather as examples of which each subject area involves. Troubleshooting acquisition problems – Has an acquisition failed? If so why? File systems – live vs. deleted vs. unallocated, characteristics of flash memory etc. Working with raw data – e.g. working in a hex viewer, nibbles, bytes,offsets etc. Each of the five subject areas defined at the middle level can be broken down further into competencies and expected outcomes. Benjamin Bloom, a prominent American educational psychologist described learning in a particular area as consisting of a spectrum of skills (Bloom, 1956)2. A skills spectrum can be considered similar to a ladder with less demanding skills at the bottom, building in complexity to higher order skills at the top. For example, when considering thinking (“cognitive”) skills, low order tasks often involve simply recalling information. As learning progresses, an individual should able to apply knowledge to a task or problem. Evaluation skills such as comparing, contrasting and judging are at the highest level. These expected competencies can be used to define learning objectives and can form the basis of assessment programmes; in other words we can define what we expect a mobile forensic examiner to be able to do. In order for the model proposed here to be truly useful, the five subject areas (and sub- topics) defined at the middle level need to be refined, completed and then broken down into competencies at the different levels of Bloom’s Taxonomy. Including experienced mobile forensic practitioners from different organisations and countries in completing the model is critical to ensuring that it is representative and has practical application. Volunteers are welcomed! 2 Bloom’s work has the daunting title “Taxonomy of Educational Objectives”, put simply it is a structure for learning. Once complete, this model can be used to write job (accurate) descriptions and provide input to workplace performance evaluations, structure training programmes and assess examiner competency. Organisations can use the model to better understand the skillsets of their staff and to ensure that they have staff with capabilities across all of the relevant subject areas. Minimum competency standards for different roles (for example, a “Triage Examiner” or “Smartphone Data Analyst”) can be agreed at an organisational level. If successful, this could be used to define a national competency standard within a particular country. This document has proposed a three level model to describe the role of a mobile forensic examiner. It is hoped that this can be used to enhance understanding of the role played by mobile examiners within an organisation, reduce staff churn and raise standards in mobile device forensics. Bloom, B. (1956). Taxonomy of Educational Objectives. Handbook 1: Cognitive Domain. Longman. Petty, G. (2004). Teaching Today – A Practical Guide. Nelson Thornes. Kevin Mansell was invited to address over a hundred phone examiners from the law enforcement community at the Mobile Telephone Examiner’s Conference in February 2009. Kevin delivered a presentation titled ‘How Big Is Your Iceberg?’ which is now frequently referred to simply as ‘The Iceberg’ presentation. 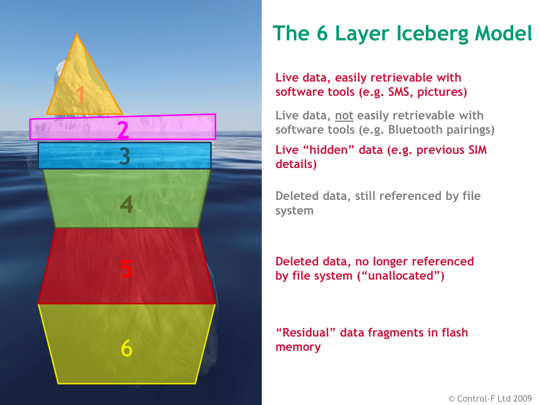 Kevin suggested that the forensic examinations of electronic devices such as mobile phones are akin to icebergs. What you can see “above the water line” may only really be a fraction of the potential evidence which can be recovered, and which may be relevant, to an investigation. In his presentaion, Kevin explored what lies “under the water” and how the use of physical acquisitions (“hex dumps”) to retrieve deleted data, free software tools and knowledge of how mobile devices store data internally can radically enhance an investigator’s ability to retrieve key evidence.